The variable speed control of this Motorized Sausage Stuffer lowers and raises the piston with variable speed that you control from slow to fast, letting you stuff at your own pace. The included electric foot switch allows you to stuff your sausage hands free. 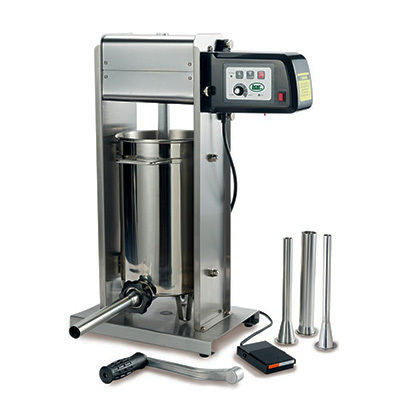 The sturdy stainless steel body, base and removable cylinder make filling and clean up easy. Includes four stainless steel stuffing tubes: 1/2", 5/8", 1", 1-1/4" OD. Handle included. The motor is exclusive to this sausage stuffer only. This is a NON-INVENTORY special order. Please allow 4-6 weeks for delivery.